That's better. Even though I was only in the office two days this week because of a meeting at my Alma Mater (Go Boilers!) and the Great Icestorm of 2011, it's been a long week! Top it all off with a work event tomorrow, and I'm ready to wave the white flag. So I'm going to be a little lazy on here today. Please forgive me. 1. I can no longer kid myself that I can pass for a college co-ed. While on campus on Monday, the signs were clear. As more than a decade (gosh, that sounds like forever) has passed since I got my college diploma, I am woefully out of touch with the college set from fashion to vocabulary. A co-worker did an unscientific study and declared 7 out of 11 co-eds were wearing Uggs (in their defense it was FREEZING). I also saw WAY too many sock hats in the shape of monkeys, bears and even raccoons! 2. I love living in a community where they take care of snow/ice removal! I know I pay for it monthly, but after hearing about how many people fell this past week while trying to remove the inches of ice from their driveways, cars and sidewalks I'll gladly hand over my HOA fees! SpaldoBusiness: Looks like the #Indy AM commute was icy but back to full swing. You also can tell the haves (garages) from the have nots. 4. 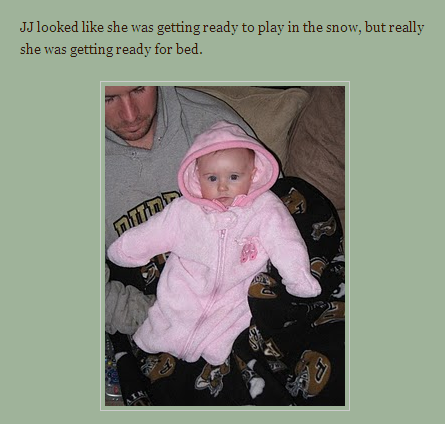 Sticking with the winter weather theme, isn't she adorable? My baby sister posted the photo on her blog Frugalista Farm Life. 5. While iced in at home this week, I realized that I need a couple of overnight work trips soon because I'm almost out of coffee! What? You don't take the coffee packs from the hotel room to use at home? I don't believe you! They are perfect for a single gal wanting to brew up a cup or two! 6. You never realize how nice it is for the gals at the Starbucks drive-thru to recognize you until those said gals are not there and you get the wrong drink! Boy, I hope Pam is back on Monday. Off to get some work done! Happy Friday all.